Sangri-La sage is as close as humans have been able to come to reaching the legendary city of nirvana. With frilled, fuzzy foliage and a delicate fragrance when crushed, the evergreen basal rosettes of leaves create a soft cushion for the large bloom spikes. Towers of flowers arise from their pillow-like beds in late spring. The intricate patterns displayed in the individual flowers are a wondrous sight. As the profusion of blooms continues through the spring, bees, butterflies, moths and other hungry nectar seekers flock to this floral paradise to quench the thirst following a long winters fast. However, not all good things last forever and the sense of tranquility will fade through the season if you don’t take care and deadhead the spent flower stalks of this plant. 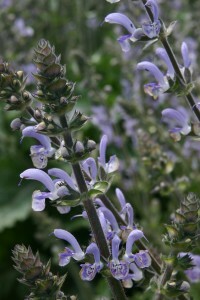 After the blooms have faded and the flower stems are cut back, the soft rosettes of foliage return for a peaceful rest. The summer fall and winter foliage collects energy just waiting for spring to come anew and transport you back to Shangri-La and nirvana once again, even if only for a few glorious weeks.